How big are your cheesecakes? 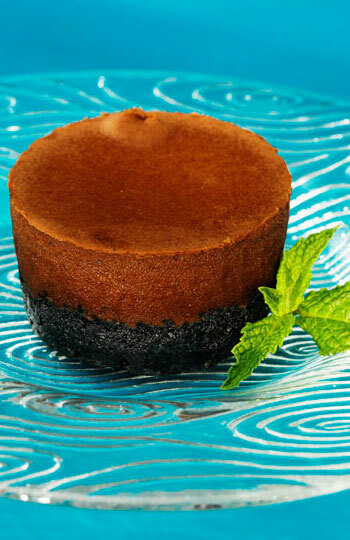 Our cheesecakes are 2.5-inch cupcake size cheesecakes, a "me-sized" indulgence! How big are your Pies? Please check our flavors page for a basic list of cheesecake and pie flavors. Some flavors are seasonal and are not available at all locations. Please check with the retailer for specific flavor information. What is the best way to store Cheesecake Love cheesecakes and pies? Keep frozen until the night before serving and then move your wrapped dessert to the refrigerator. Before plating, unwrap and place the pie or cake at room temperature for about an hour but no longer than two hours. Can the cheesecakes and pies be re-frozen? Yes! Simply wrap remaining dessert tightly in plastic wrap and freeze for up to two months. Defrost in the refrigerator preferably for 24 hours before serving again. What are some serving ideas for a party? A fun way to serve cheesecake is to offer a cheesecake bar. Purchase at least two of your favorite Cheesecake Love flavors. Pre-slice and set out with fresh fruit, whipped cream, chopped nuts, and dessert sauces such as caramel or chocolate sauce. Your guests will enjoy topping each slice however they like! Where are your cheesecakes made? We bake fresh at our specialty kitchen in Dallas, Texas. Are you able to provide large quantities at bulk rates? Yes! Direct inquiries to info@cheesecakelove.com. We will be happy to accommodate your order and any special needs you may have. Do you provide cheesecakes for weddings? Yes! Please Email: info@cheesecakelove.com for catering and delivery rates. Does Cheesecake Love have a Corporate Gift program? Yes! We are happy to consult with you to set up a customized gifting program that will make an outstanding impression. Email Us: info@cheesecakelove.com for more information.